A thing of light and substance, Marsh Hill settles into the landscape in an Area of Outstanding Natural Beauty (AONB) near Snape Maltings - a private home in a secluded spot overlooking the river Ore as it meanders out to the North Sea. Perched atop a hillock, there is nothing but marsh grass and heather between it and the river’s edge. This outwardly simple, wedge-shaped structure was conceived by Mole Architects for clients, Ben Baglio and Richard Wilson, a culture-loving couple who had long been dividing their time between London and Suffolk. 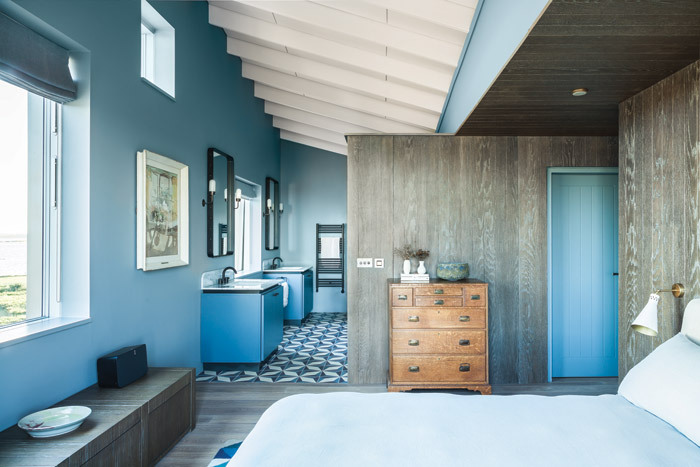 Tired of their Edwardian house in the town of Saxmundham, they wanted a change, something more bespoke and contemporary, set in the countryside where they spend most of their leisure time, walking their beagle, Henry. Practice directors Meredith Bowles and Ian Bramwell presented a number of options, and the clients chose the boldest: a singular house that addresses the landscape in a very direct way. As a house in an AONB and with two immediate and wary neighbours, one to the west and one to the northeast, Marsh Hill had to meet many requirements. It solved the main issues through clever positioning: approached from the east, it appears to be a modest, two-storey cottage. You don’t get the full length and wedge effect until you stand to the house’s south, where no dwelling - other than the water fowls’ nests - is found. From this aspect, the simple white brick structure is remarkable only for its shape and the way it is split horizontally by overlapping zinc roof tiles that taper down from east to west. From the rear, the structure becomes more interesting but subtly so. The north elevation is embedded in the hill, and as you ascend the gentle gravel driveway you find the entrance nestled within a small protruding wing. All along this winglet and continuing for an equivalent distance to its left, there is nice brick detailing - alternating courses of white-painted bricks have been dovetailed with their neighbour, creating a feathered pattern. The painted front door is coloured bright yolk yellow. When you stand back slightly, you see the roof is planed at an angle, like the wing of a gull - and indeed, herring gulls have proved the inspiration for these characterful touches, from the shape of the roof and the beak-yellow door to the skinny metal brackets that support the roof overhang. Says Bowles: ‘Over the years we have become far more alert to the experience of living in a house. Once inside the front door, the house reveals itself as a carefully choreographed sequence of spaces that offer both containment and revelation, mediated by many craftsmanlike touches. For example, the porch interior is a wood-panelled wedge, with a small bathroom perched at its apex. This sets the tone for the dialogue between simplicity and quirkiness that permeates the house. The dramatic views from the main living room are certainly there - great silvery vistas of shimmering water and reeds - but Mole has resisted the ‘Grand Designs’ gesture of placing vast expanses of glass across the entire south of the building to offer something more layered. Says Bowles: ‘The temptation with a view like that is to make the wall all glass. But it becomes a very singular experience.’ As he points out - glazed walls at night and through the winter can become cold and foreboding; and in summer lead to overheating. Instead, this white-painted south wall offers two generous windows which come halfway up the two-storey space, while the upper part of the wall is occupied by a ceramic installation, commissioned by the couple from Valeria Nascimento. The couples’ art collection plays an important part in setting the atmosphere and tone of the house, and Mole worked closely with the pair from the start to accommodate key pieces. One of these — a trio of textile panels commissioned from Rita Parniczky — occupies the upper left hand wall of the living room, illuminated by its own vertical window. As the winter sun strikes, filigree silvering within the cloth becomes interlaced with skinny shadows cast by the rivulets of black thread which pattern the surface; a mesmerizing effect that chimes with the watery setting. 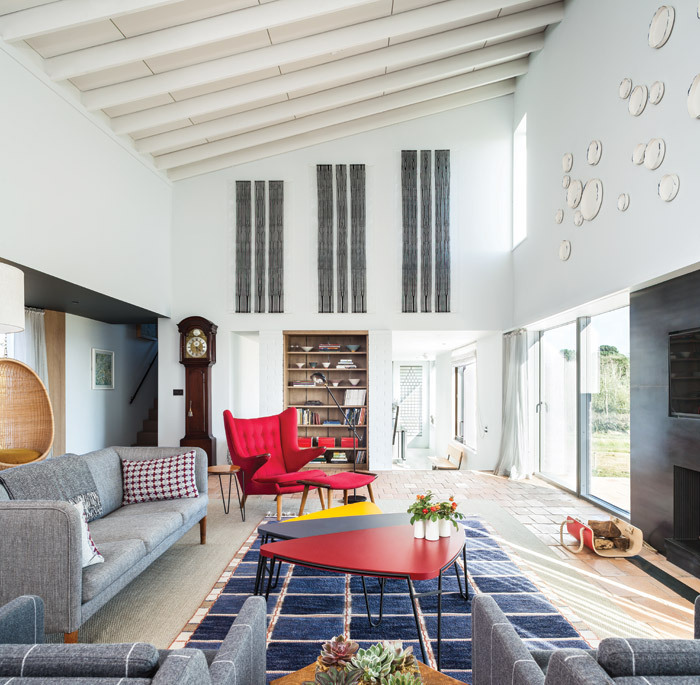 Although the living room is large, it doesn’t feel overwhelming; partly thanks to the alcoved area at the rear, where an Egg hanging chair is positioned, the stained oak panelling that lines the porch-side wall and the elegant assortment of mid-century furniture and lamps. Alcoves are a common feature in this timber-frame house. 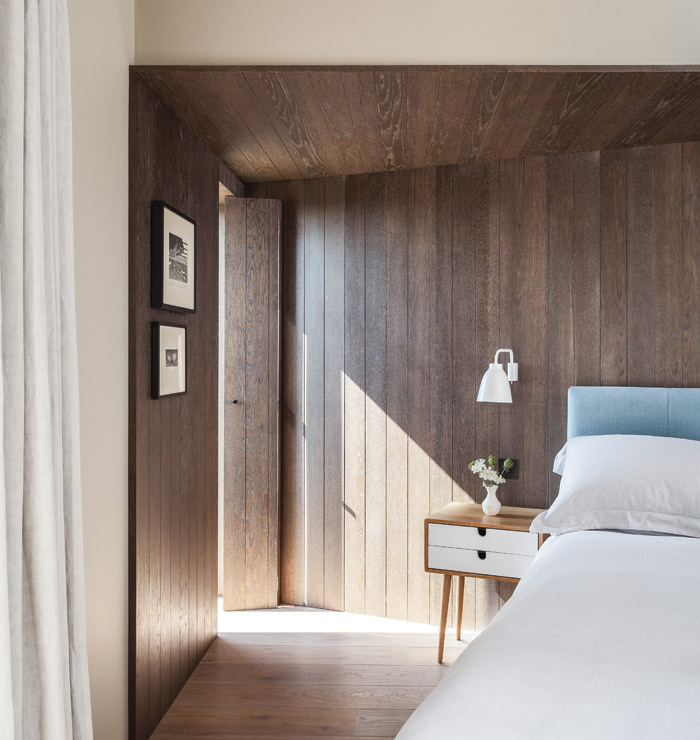 In the guest bedrooms, placed in the single-storey end of the building, beds are set into an angled wall, which is alcoved with more timber panelling. At times, Bowles agrees, it feels like a ‘very refined beach hut’. 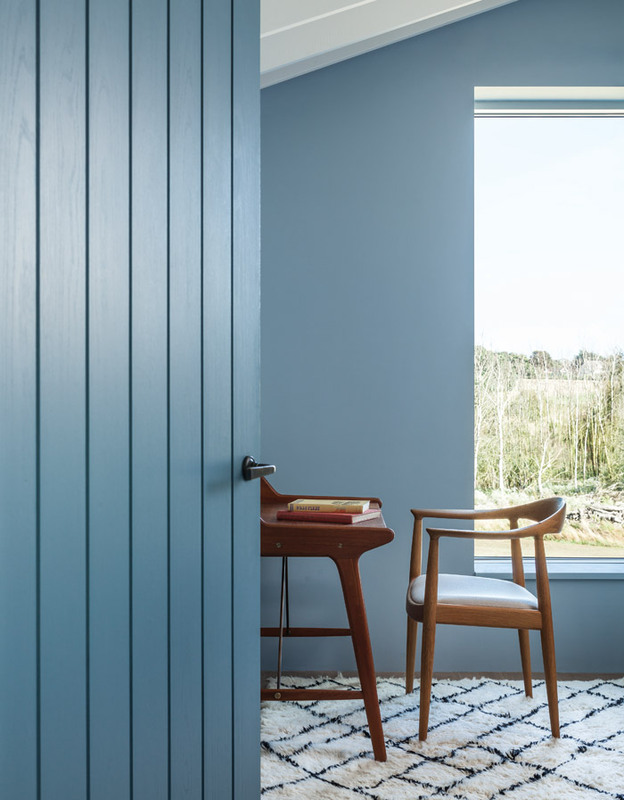 Windows in the bedrooms are also thoughtfully positioned – one tall, thin, ‘human-sized’ window at the pillow end (for early morning vistas), and a larger one that opens out onto the garden, at the foot of the bed. A small studio where Ben makes his own ceramics is the last room to the west. 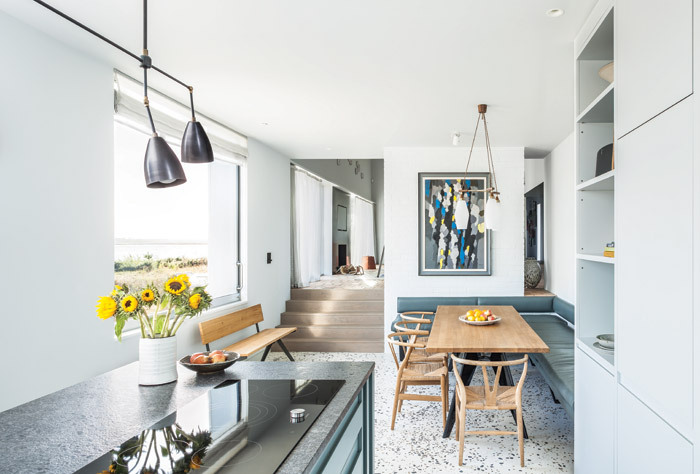 East of the living room there are steps down to a light-filled kitchen, its floor covered in a chunky, tan and grey terrazzo floor. Windows continue in the same scale and rhythm as the living room’s; but, starting at waist height, they seem to loom larger, with deep frames for the placement of objects and ceramics. One of them, placed opposite a long dining table, slides right back into the wall to give uninterrupted views of the river in summertime. Upstairs there is a tranquil study to the rear of the house, and a master bedroom with its own en-suite bathroom. The bathrooms all have geometric tiles - a brave move, given the rooms’ often odd geometries. But bathroom furniture is simple, robust and square, to anchor the space.